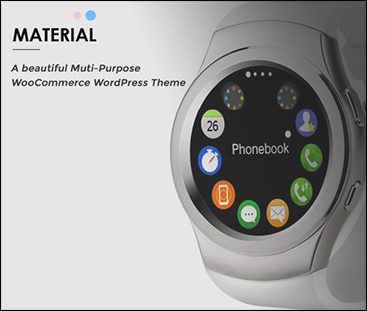 There’s no denying there are plenty of multipurpose WordPress themes on the market today. As a result, deciding which one is best for your website designing needs can be tough. 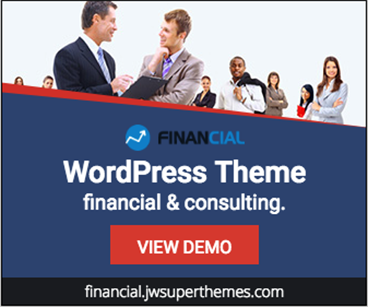 After all, you don’t want a multipurpose theme that’s so packed with features that it negatively affects the speed and performance of your website. 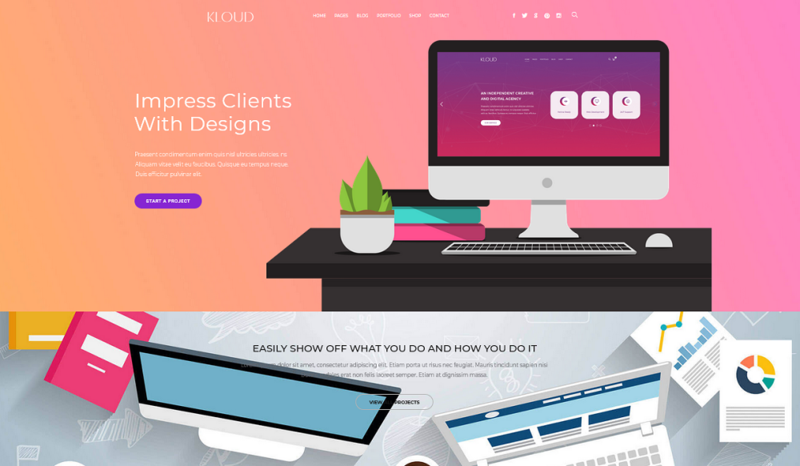 That’s why looking into Kloud, and creative, versatile, and fully responsive multipurpose WordPress theme is something you need to do right now. 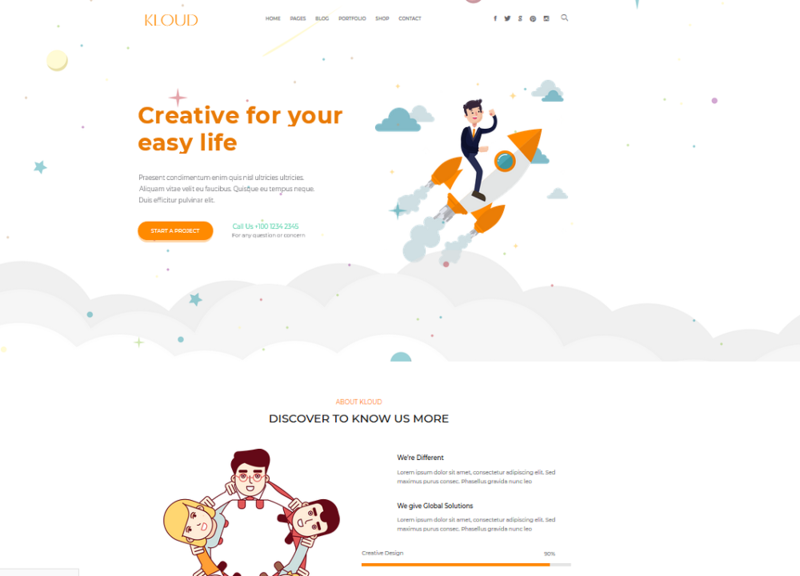 Designed to drive traffic to your site, help you build a bigger following, and encourage more online sales, Kloud is a robust multipurpose theme that packs just enough punch to give you the design and functionality you need to create the website of your dream, without all the bloat and performance issues so many feature-packed themes cause. 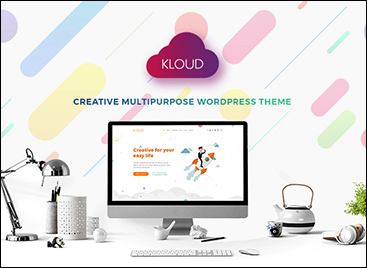 Kloud is a mobile-friendly creative theme that comes fully SEO optimized so site visitors can find you in all search results. This means more traffic comes to your site, more online sales are finalized, and more subscribers sign up for your email list. 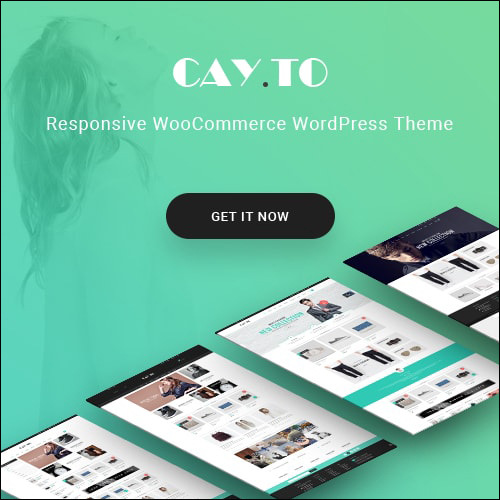 It’s built on the Codestar Framework, a lightweight and easy to use WordPress Choices Framework designed to keep your website running smooth and functioning right at all times. In addition, Kloud comes with theme support, which can be accessed in the support forum. Here, you can receive tech support, help with bugs or issues, and feature help from a dedicated support team within 1-2 business days. 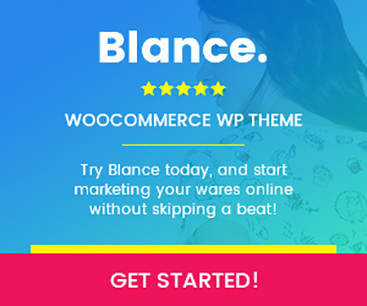 Not to mention, if you need help setting up Kloud on your website, the team behind the theme will assist with your theme set up for free. 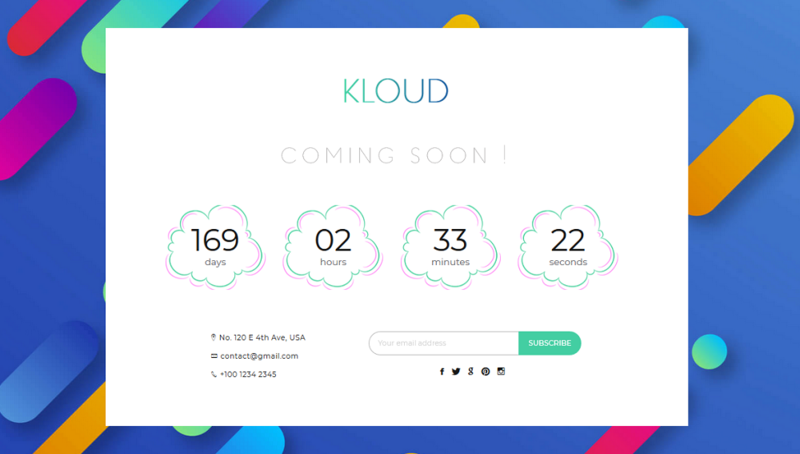 Now, let’s take a look at the features Kloud has and how you can use them to create the website of your dreams. 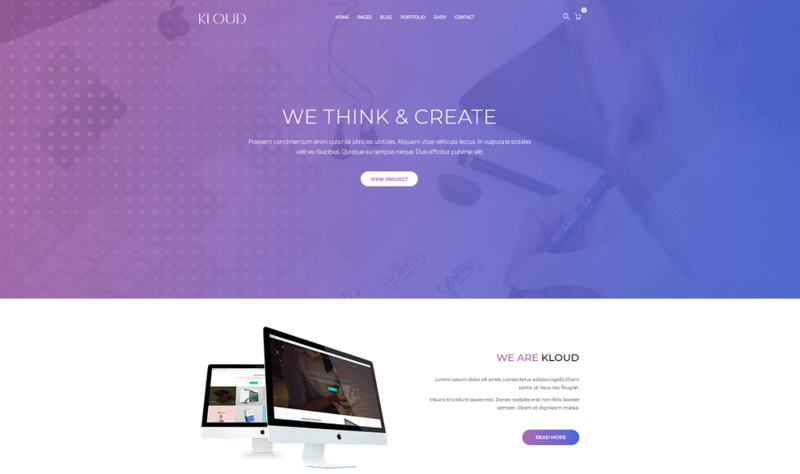 Since Kloud is a multipurpose theme designed to give creative website owners of all kinds a way to create a unique website for their industry, it makes sense that it would come pre-packaged with 6 distinct homepages to give you flexible options when it comes to both design and functionality. Let’s take a quick look at each so you know what your options are. 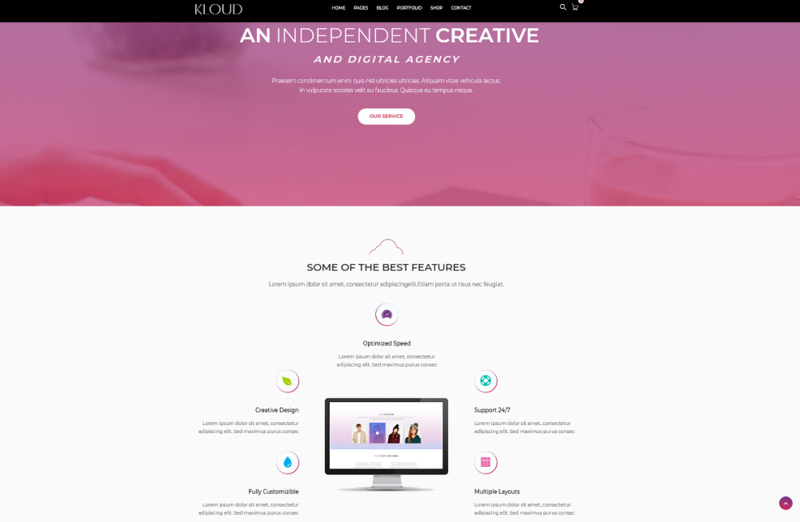 Designed for creative agencies that need to showcase their best work for potential clients, Kloud’s Digital Creative Agency homepage boasts a large hero image slider for catching people’s attention, a grid like featured projects section, complete with categories and links to individual projects, and a skills section for detailing what you have to offer clients. 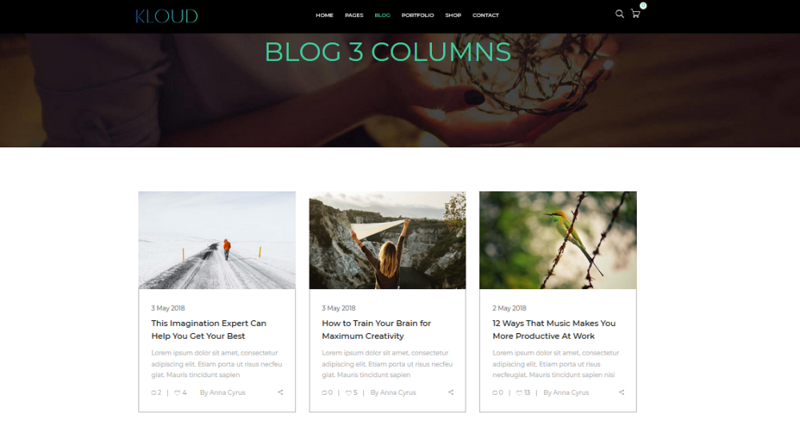 It also comes with a testimonial section of sorts, links to your latest blog posts, and a multi-column footer for displaying company and contact information, your navigation menu, and even an Instagram feed. 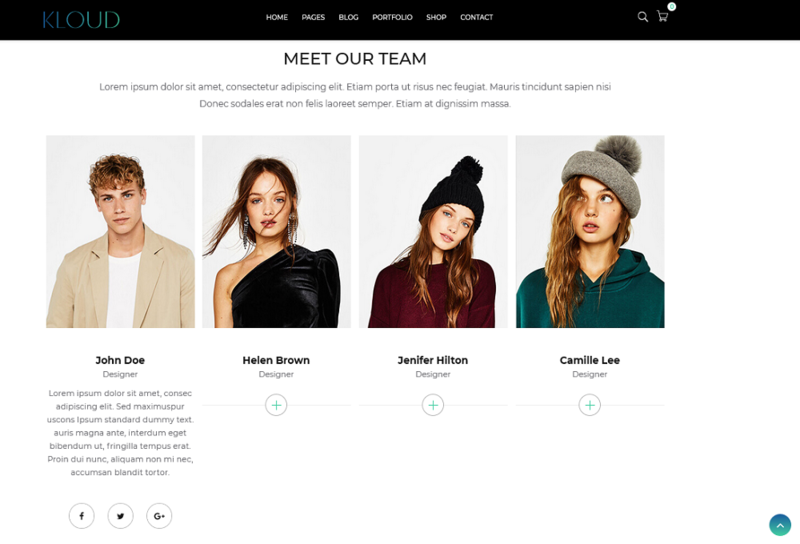 This homepage option is seemingly another take on a digital agency setup, complete with a large hero image with a link to the specific project or image, a simple About Us section, a company features section, and of course, a grid like view of your best work. 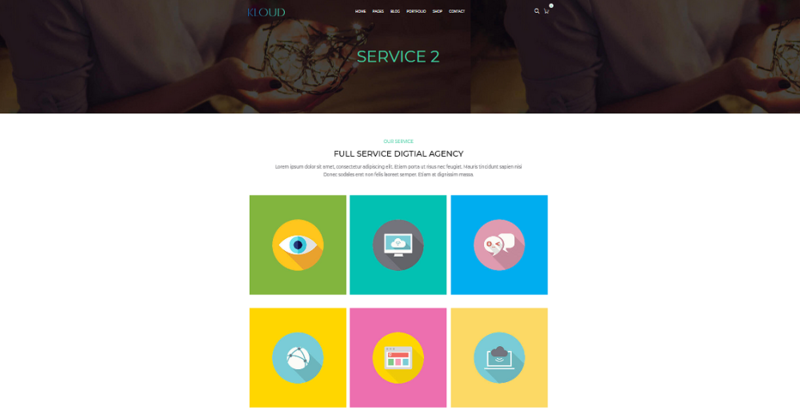 Not to mention, there’s a services and team section for showcasing your agency, a testimonial section with slider option, a newsletter subscribe box that spans the width of your website, and the famous 4 column footer section where you can integrate lots of company information, your site’s menu, and Instagram feed. For those who run an independent agency or firm, but still want to maintain a creative edge, this homepage option is for you. Stunning colors will complement your best features section, embedded video content, and team section (if you work with others). In addition, let people scroll and see your latest work, browse categories, view your pricing plans, check out your latest blog posts, and even fill out a convenient contact form located right near the bottom of your screen. And don’t forget the tiny navigation menu that sits at the bottom of your homepage, making it easier for people to navigate other areas of your website when they need to. Are you looking for an easy way for clients to submit projects to your agency or firm? Make it simple on them by showcasing a large hero image, complete with contact information and links to a page on your site that’ll let them input their project needs. In addition, tell interested people about your agency, display your latest work, explain how their projects will be fulfilled (step by step), add a list of services your provide customers, and don’t forget to add satisfied client testimonials. Also, link to your blog post content, let people purchase or contact your firm, and create an efficient footer section with company information, links to more contact forms, a navigation menu, and social share buttons. 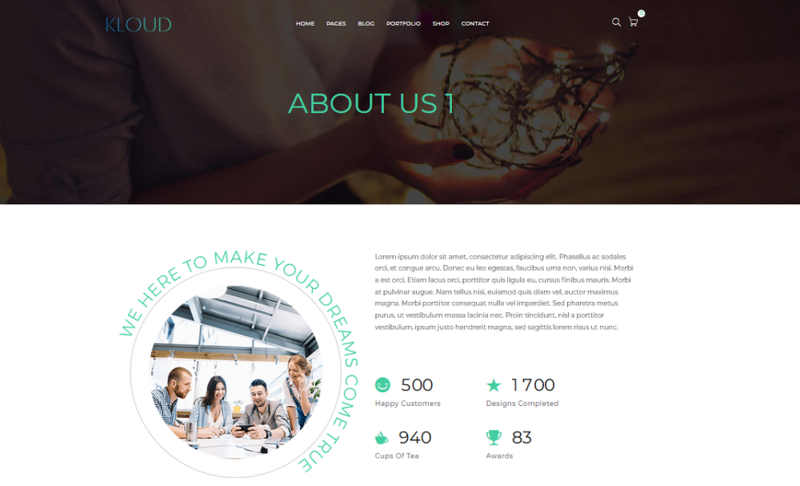 For a truly unique looking layout and design, check out Kloud’s Creative Digital Lab homepage; you won’t be disappointed. To start, display the navigation menu on the side of your website for a less intrusive way of showing people how to navigate your site. Adding to this, include a search bar and social share buttons for a better user experience and additional brand sharing opportunities. 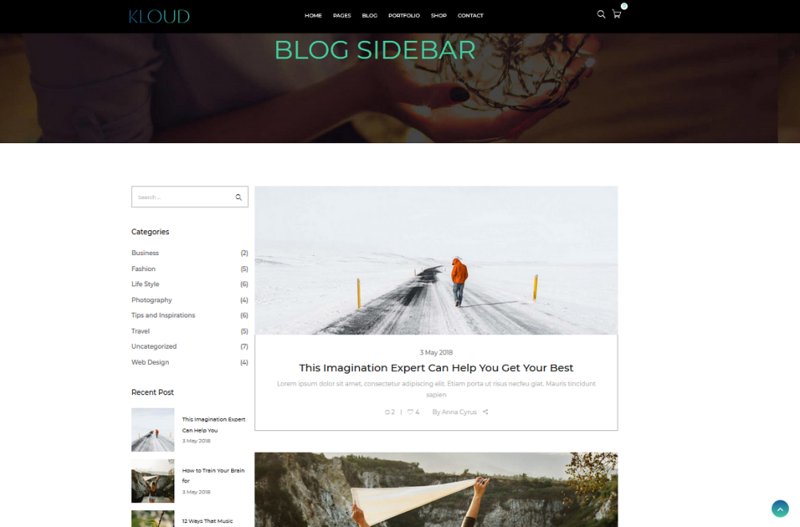 On the main section of your homepage, enjoy a minimal look that packs a punch for your company. For example, show off your latest work, explain your company to new site visitors, showcase positive testimonials, as well as your team members, and include a pricing table so people know what to expect to pay when they hire you. Lastly, link to your blog content, add a contact form, and create a simple yet effective footer section with your company logo, contact information, social share buttons, and menu options. 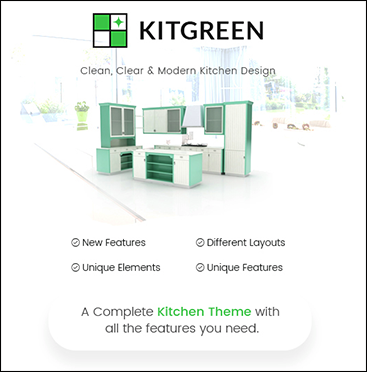 If you are into the trendy flat material design, this homepage will surely impress you. 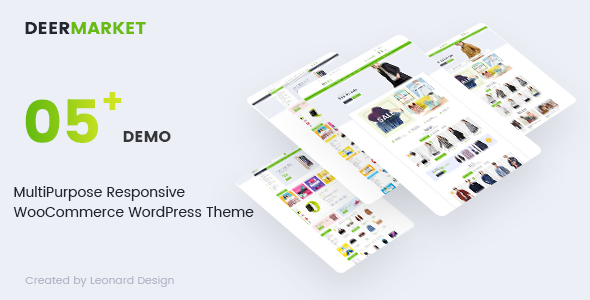 With a large hero image making it easy for potential clients to reach out and submit projects, you can start generating more revenue than ever right away. 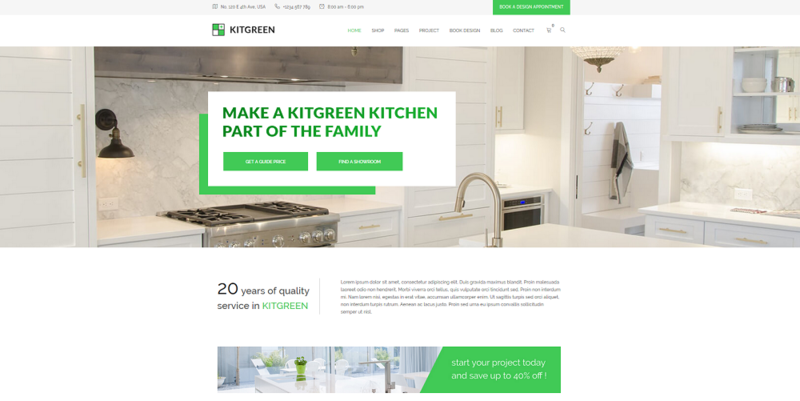 You can also link to all your firm’s projects and utilize the colorful and chunky block style to showcase your company, team members, and services. And, as always, display a convincing testimonial slider and multi-column footer section for added information like your agency’s description, useful links, contact information, and social share icons. The team pages showcase profile images, job descriptions, and even social share buttons so clients can stay in touch with their favorite team members and keep up with their latest design work. And best of all, the Coming Soon page includes a convenient countdown timer so people will always know when to expect your official site launch. Plus, there’s a subscribe box for building your email list and company contact information so clients can get in touch before they can actually book you. 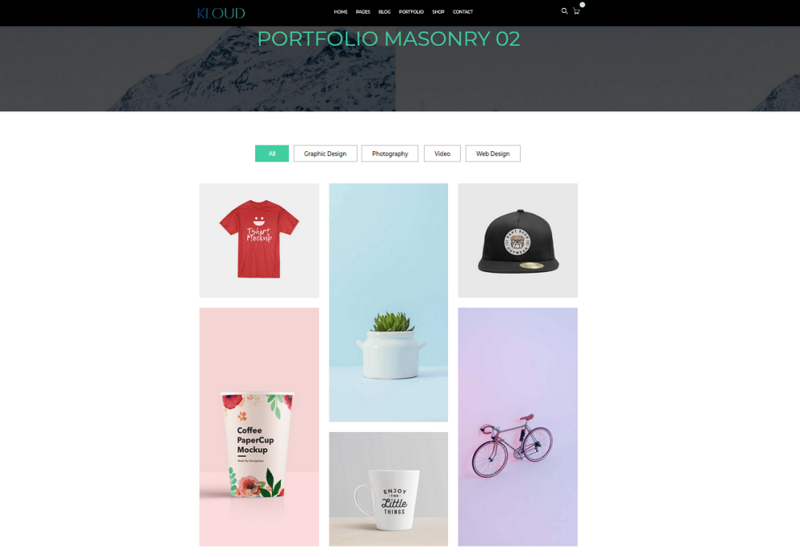 And, in keeping with its creative design, Kloud maintains bold colors, blocked off shapes, and stunning imagery, all of which can be imported using the one-click demo importer for easier site building or inspiration. Being able to connect site visitors, even if already clients of yours, to your latest blog content is how you boost client retention, keep people engaged, and provide additional value to those shelling out their hard earned cash to your designers. And, whatever footer design you create will follow your layouts, as will your shopping cart should you run an eCommerce shop with products and services site visitors can buy. 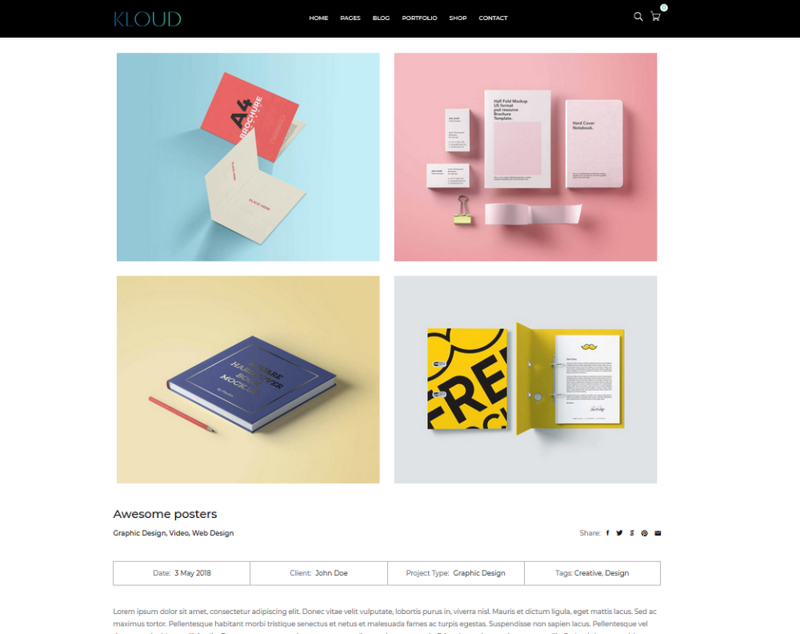 To help your creative agency or design firm shine, Kloud offers plenty of portfolio variations that will highlight your best work or latest projects. 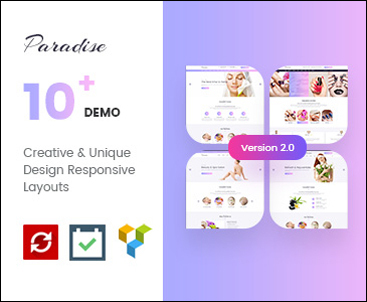 These layouts also give prospective clients a way to get more information about a specific project, browse categories they are most interested in, and even see individual portfolio items. Each one is able to give you a great way to show people what you have to offer, in beautiful color schemes, and with complete information about each individual project so clients always know what they’re getting when they hire you on as their creative mastermind. 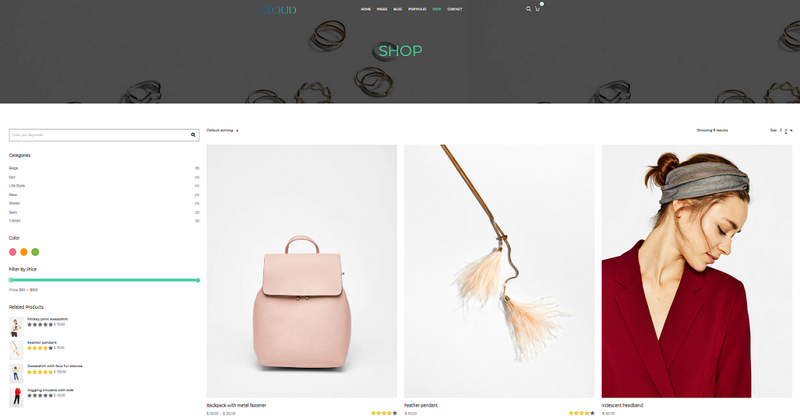 Lastly, Kloud prides itself on being 100% WooCommerce ready so you can easily sell your work and collect secure payments, all from the convenience of your website. Use a 2, 3, or 4 column layout to display whatever you have for sale. Or, utilize the sidebar option and include a search bar, categories, and filtering options like color and price. Even recommend related products as a product upsell and cross-sell strategy. If you prefer, take advantage of the single product page and show multiple images of one product. Plus, add a product description, size chart, add to cart button, pricing, categories, and SKU number. And don’t forget the social share buttons. In addition, include additional information, product reviews, and of course, related products so people can continue to shop for things that are already of interest. With Kloud’s spectacular WooCommerce integration, you’ll be able to boost sales, keep people engaged, and encourage further brand expansion by giving people a chance to share their favorite stuff with those they know and love. Creative agencies are nothing new. In fact, there is a lot of competition out there when it comes to designers. 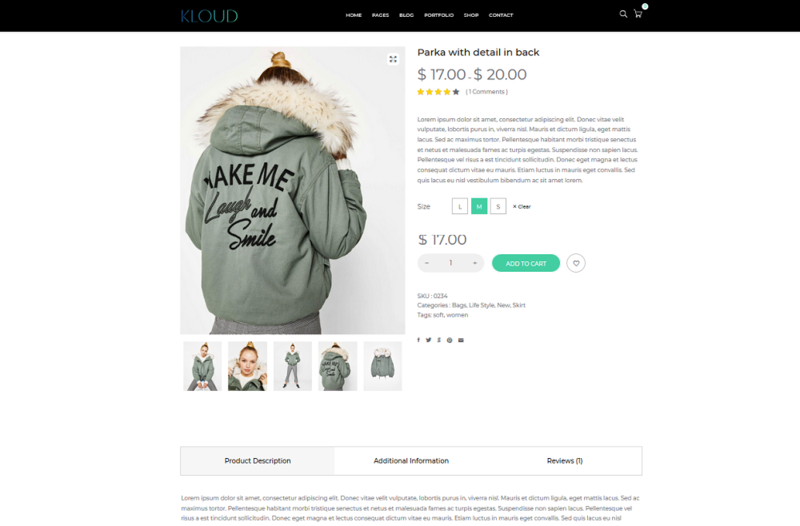 However, the team behind Kloud is dedicated to maintaining strict design principles that fit modern day trends, to keeping features low enough to not affect speed and performance, but give you enough to create a stand out website, and to integrating the most popular eCommerce plugin on the market today right in to the theme package. As a result, you’ll become one of the most reliable and popular up and coming design agencies around.